It takes a while to penetrate the thicket of Victorian bramble that surrounds A.S. Byatt's Possession, but the beating heart of the novel within makes it worth the effort. Possession opens with two letters falling from the pages of a book unearthed from the depths of the British Library. The letters suggest celebrated Victorian poet Randolph Henry Ash had a previously unknown relationship with Christabel LaMotte, Ash's overlooked feminist contemporary. The discovery is all the more surprising, given that Ash was married to someone else for forty-one years and LaMotte was assumed to have been a lesbian. Roland Michell, the discoverer, teams up with Maud Bailey, a cool and patrician LaMotte expert, and the two race against other poetry researchers to be the fist to unveil the discovery. Writing-wise, Possession is a coup. Its intricate plot weaves together dozens of characters, spans two continents and flips back and forth between Victorian and present-day England. Even with all those elements, Byatt's novel comes across as a tightly woven tapestry. Each page pulls the various threads closer and closer together so at the conclusion a detailed and delicate masterpiece is finally revealed. 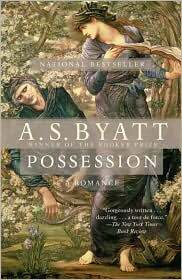 Sweeping and passionate, Possession earns each of its 500-plus pages by virtue of Byatt's detailed writing and astute character observations. It's romantic in the most authentic sense of the word and makes honest inquiries into the psychologies of people in love. There is no way you could have known that I finished reading an A.S. Byatt book this morning, and was wondering if I should read another of her books after having merrily chewed through two of them in a row. I take this as a sign from the literary gods that I should ride this tangent. I just bought a new copy of this at the Goodwill (.99 cents, great deal) because my other copy finally fell apart after reading and rereading. Every time I reread it I see see and feel somtething different. I have recommended it to everyone I know and no one has tackled it (too busy reading Girl with the Dragon Tattoo, I suppose) so I love that I finally get another opinion of it. I think this book is truly a 20th century masterpiece.